This winter SoccerPlus Outreach is pleased to announce our second annual Harambee Campaign. Harambee is the Swahili word meaning "we ALL pull together". The idea of the campaign is to raise funds while asking people, companies, teams and clubs to give within their means. Donating is only part of the campaign, everyone has a role to play, and a platform and voice to express. Use your presence to recruit others to join our team. We will be operating 2019 on a $6000 budget. Our operations include running our life-skill classes and soccer programming for over 1,000 children in the Manyatta slum and includes meals and clean water for our student athletes as well as school fees for the most needy children and their families. Through our self sustaining projects we have raised $1500 (25%) of our need. As we build toward being self-sustaining we are relying on donations. Join our team today by donating and or spreading the good word about Davis and his work in the Manyatta Slum. I am donating $500 to this cause and I challenge you to get your team, club or company to match my donation. Davis is known as the slum father in Manyatta because of his work with the youth. Our Story: Our journey began in 2014 when five colleagues and I traveled to Kisumu to coach at various schools in the West Kenya region. Our lives changed when we encountered the work of one man, Davis Ouma, in the Manyatta slum. Davis was working with the youth and created the Super Slum Soccer League, which had the focus to keep the youth in school through the sport of soccer. Students who could not afford to go to school would receive assistance with their school fees arranged by Davis who found a way to work with the community. Davis has since continued his vision, transforming Manyatta into a community dedicated to the future of their youth. Davis, with our support, has created a semi professional soccer team, Kisumu Greenland SoccerPlus FC, using the club to jump start his cause and support in the community. Davis coaches Greenland to represent Manyatta slum and bring the community together. Several players on the team help facilitate games, practices and now life-skill classes for the Kisumu Greenland Soccerplus League (formally the Super Slum League) which reaches over 1000 youth living in the slum. The life skill classes focus on how to make the right decisions when one is surrounded by hundreds of temptations to make the wrong choices each day. 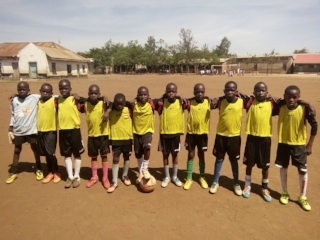 Over the past couple years, SoccerPlus Outreach & Kisumu Greenland have partnered with several groups including Regis College and the Catholic University of East Africa. During these partnerships, Kisumu Greenland hosted local tournaments for the youth, contributed to several local clean up days throughout the slum, produced dental and sanitation hygiene programs at local schools and distributed thousands of pound of soccer equipment, including team uniforms, to over 40 local schools and clubs. In 2018, the Harambee campaign raised $3600. SHaron teaching a LIFE-SKILL class to 40 youth. Why Kenya? There are many areas of our world and our country where our resources can go to "make a difference". In Kenya, the dollar is elastic, stretching further, allowing your donation of $20 to be more effective. $20 will pay for full meals for 40 students after their life-skill classes and games. $20 will pay for 200 students to receive the daily water they need. $20 will buy two pairs of cleats for deserving youth. $20 will buy 7 life-skill books which students need in order to partake in classes. $20 will pay for the instruction of two life skills lessons for 40 students. $20 will pay for 3 months of schooling for elementary school students. 100% of the funds will be placed in the hands of Davis, a local leader, and his team working hard to make a difference in his community. Self Sustaining Initiative: Our goal is to have 100% of our budget come from our self sustaining initiative. In January we have 14 alumnae from Regis College travelling to Kisumu City to hold a women in culture summit. Our hope is to use this model of hosting groups to break down barriers, reduce stigma, teach global perspective, build relationships and fund our project year round. Regis College Alumnae is our pilot program. We are hoping that this trip is a success and that we can host more in the future, more information to follow after the winter season. As someone who has already donated over $10,000 of his own money into SoccerPlus Outreach, there is no better way to share your resources than on investing them in the youth of tomorrow. I believe in the work that is happening in the Manyatta Slum and truly believe soccer will be the vehicle which will allow inspiration and change to take place to the youth who need it most. Join our team and Donate today! Notes about your Donation: 100% of your donation goes directly to our leadership team on the ground. The donations are sent to Davis in monthly installments. We encourage you to include the name or names of the people who inspired to make your generous contribution. The power of soccer to unite communities and change lives is often overlooked and undervalued. The goal of SoccerPlus Outreach is to enrich lives and transform communities through soccer and education. SoccerPlus Outreach seeks to provide educational opportunities to children and young adults in challenging environments across the globe - and to provide people with the tools to succeed in life on and off the pitch. Their programs help rebuild struggling communities and bring people together through the the beautiful game of soccer. Tony DiCicco gave his life to the game - however, for him, the game did not live inside the white lines. It lived on all sides. The game was a vehicle to inspire others to be their best selves and to find their purpose. We carry him in our hearts and celebrate his life by living our lives to the fullest -- and continuing his legacy globally. Through a strategic partnership, Inspire Transformation and SoccerPlus Outreach will seek to carry on Tony's mission. In the quest for equality of opportunities regardless of gender or socioeconomic status, Inspire Transformation and SoccerPlus Outreach build sustainable programs with lasting impact.